We appreciated the cleanliness and that it was beautifully equipped. It was easy to communicate with the owners who were very helpful especially with our after hours check in and requests for a quiet room and luggage storage after check out. Newly renovated rooms, beds were very comfy. Extras toilet in two bed apartment. Great location. Location was great. As most Sydney hotels, there is some street noise but nothing too bad. The unit was very comfortable and well equipped. Air con in lounge and both bedrooms was great. Foyer and lift are a little unimpressive and was a bit of a smell however the apartment was great, recently renovated so everything new. Beds comfy, well equipped kitchen, micro, washer and dryer, even a hair straigtner, plenty of towels and good water pressure and plenty of hot water. Can't fault the unit, it was great value for the price. There are no facilities at the hotel but that's fine as plenty of parking stations and restaurants nearby. Small woolies just 50 metres away and ezymart across the road and great kitchen to cook in. Very easy and early check in. Very helpful staff. Great 10/10 location. Kitchen well appointed. Tastefully decorated. Lovely decor and lay out to the apartments, clean and tidy. Fantastic location. Friendly staff. Good value for money. Bed is very comfy, easy to get to places as it’s in the middle of the city. Has a kitchen for drinks etc, was a very relaxing stay. Lock in a great price for Madison Carrington Apartments – rated 8.2 by recent guests! Madison Carrington Apartments This rating is a reflection of how the property compares to the industry standard when it comes to price, facilities and services available. It's based on a self-evaluation by the property. Use this rating to help choose your stay! 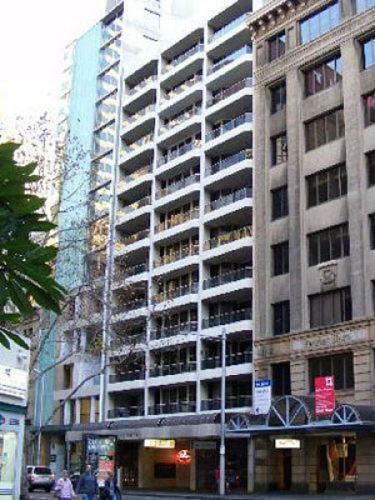 One of our top picks in Sydney.Located within a 15-minute walk of Hyde Park Barracks Museum and 0.8 miles of The Royal Botanic Gardens in the Central Business District of Sydney, Madison Carrington Apartments has accommodations with a kitchen. Free WiFi is offered. Fitted with a balcony, the units feature a flat-screen TV and a private bathroom with shower. A patio with city views is offered in all units. Art Gallery of New South Wales is an 18-minute walk from the apartment. The nearest airport is Kingsford Smith Airport, 6 miles from the property. When would you like to stay at Madison Carrington Apartments? This apartment has air conditioning, washing machine and CD player. This apartment features a microwave, DVD player and tumble dryer. Area Info – This neighborhood is a great choice for travelers interested in shopping, food and restaurants – Check location Great location - show map Guests loved walking around the neighborhood! House Rules Madison Carrington Apartments takes special requests – add in the next step! Madison Carrington Apartments accepts these cards and reserves the right to temporarily hold an amount prior to arrival. Please inform Madison Carrington Apartments of your expected arrival time in advance. You can use the Special Requests box when booking, or contact the property directly using the contact details in your confirmation. Was a slight smell in the foyer and outside the lifts. Bit of air freshener or carpets cleaned, place would have been 10/10. Also balcony was a bit grotty but I suppose that's just car pollution and hard to maintain. Shower only has a very small tank. DO NOT have water on hot, and on full. Will run out in about 5 minutes.....Tank is not big enough for 2 people to have a decent shower. Everything has been renovated inside, but the balcony and windows are still original and in need of replacement, with double glazing a definite requirement for inner city living. Also, the bathroom windows cannot be locked, so if someone was on the balcony, they could gain access. Also, at the top of that window there is an opening of about an inch which allows a lot of cold air, and noise through. TV was faulty (reported to staff). No bedside lamps. Bedroom curtains wouldn't open. Lobby and lifts could do with a freshen up, as well as Floor 9 lobby, quite smelly and aged looking. Bed was way too firm for us (was hardest of the places we stayed in Oz). Toilet seat was not on properly. No waste basket in bathroom. Hatch to ceiling was unpainted plasterboard. Might of been better to have the laundry behind cupboard doors? It seems like a lot wrong, but really it was OK, just needs a few tweaks to get a 5/5. It was advertised that foxtel and Netflix were available; however, the staff did not know about it and we were unable to view either. The apartment was in a good location and was very comfortable. 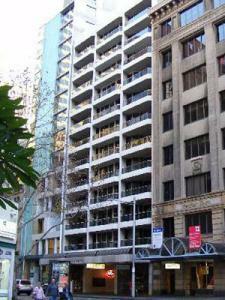 The accommodation is in the CBD which, although convenient, is a noisy location. Roadworks close by kept us awake until 2am and then garbage trucks arrived in the street at 5am. The subsequent night was quieter. Would of liked to use the balcony, no table and chairs and not clean. The foyer area seem to be under renovations so most of the entrance was covered or blocked off. Walls, carpets and lifts were very worned and outdated. There was also a slight stale smell around the building. I have made a request for an early check-in to which the property have confirmed a week. Wrote our stay. However when we arrived at our requested Check-in time, the reception girl said it was not yet ready and that the email confirmation was not a guarantee. The purpose of the early check-in was to freshen up to attend a conference. We had to leave our luggage at reception and head out without being able to change which was not desired. I was unhappy that my preparation to organise ahead of time with the property was useless since the confirmation meant nothing. The room was very clean and spaceous. Was a good surprised to see it was more mordern looking inside, since the outside foyer and reception decor was old and run down. Whole apartment stank of cigarette smoke - very strong! Cigarette butts all over balcony, cigarette in cushions on couch. Asked at reception to change rooms but none available. Reception lady went to room, tidied cigarettes up and tried to cover up smell with air freshener - it was bad the whole 4 day stay. The air conditioner in the Master bedroom was constantly dripping and spitting ice out. The bed was damp and the walls dripping with moisture. Could not be turned on. Again, showed to reception staff who agreed "something wasn't right." Th A/C in second bedroom did not work - only blew out hot air. The wrong TV remote was in the room. After spending a lot of time trying to get it to work ( and 3 trips over 2 days to reception) we were told the previous guests had taken the remote with them and they had put a temporary replacement in there which didn't allow for Smart TV connectivity which, with children at the end of a long day sightseeing, was really disappointing. The renovations going on in the building woke us every morning with loud, constant banging. The oven in the kitchen is not secured in cabinetry properly; every time we opened the oven door the whole oven pulled out - very dangerous!